Frank Caliendo (born January 19, 1974) is an American comedian and impressionist, best known for his work on the Fox Network television series MADtv, and as the in-house prognosticator for Fox NFL Sunday. In 2007 and 2008, he performed his impersonations on his own show, Frank TV, which aired on TBS. He is known for his impressions of Charles Barkley, NFL color commentator John Madden, sportscaster Jim Rome, comedian Robin Williams, actors Morgan Freeman and William Shatner, and United States Presidents George W. Bush and Bill Clinton, and for his frequent appearances on The Bob & Tom Show. He has released six solo CDs, and has performed as many as 120 impressions. From 2009 to 2011 he had a show at the Monte Carlo Resort and Casino on the Las Vegas Strip. He now tours. Caliendo was born in Chicago, Illinois, on January 19, 1974, and grew up in Waukesha, Wisconsin, where he attended Waukesha South High School. He is of Italian ancestry. Before graduating from University of Wisconsin–Milwaukee, Caliendo began performing stand-up comedy at many different local night clubs and comedy clubs, eventually taking a job as a master of ceremonies at a local comedy club. Frank quickly became known for his spot on impressions of Columbo, the Seinfeld cast, Jonathan Winters, and many more which he mastered while bedridden after a painful back surgery. Within just a few years, he was very active on the college circuit, driving thousands of miles in his car. During these years, he built a reputation as one of the circuit's top performers. Between 2000 and 2001, Caliendo made his television debut on sketch comedy series Hype and later gaining significant national exposure on the comedy series MADtv. Caliendo has performed stand-up on such series as cable's Premium Blend, Late Show with David Letterman, Late Late Show with Craig Kilborn, The View, The Late Late Show with Craig Ferguson, and Late Night with Conan O'Brien. He was featured in Comedy Central's animated series Shorties Watchin' Shorties in 2004. His signature John Madden impression is frequently seen on Fox NFL Sunday, The Best Damn Sports Show Period and Mohr Sports. Caliendo has also appeared on Comedy Central's Comedy Central Presents, as well as many radio shows, including The Free Beer and Hot Wings Show, Randy Baumann and the DVE Morning Show, The Dan Le Batard Show, The Junkies, Bob & Sheri, The Bob & Tom Show, Mike and Mike in the Morning, Opie and Anthony, The Don and Mike Show, Rise Guys, Bubba the Love Sponge, The John Boy and Billy Big Show, The Howard Stern Show, Mike and the Mad Dog, Elliot in the Morning, The Sports Inferno, The Rick and Bubba Show, The Roe Conn Show, The 105.7 WAPL Rick and Len Show, Preston and Steve, Bob and Brian, The Glenn Beck Program, Holmberg's Morning Sickness on 98 KUPD in Phoenix, and Lamont & Tonelli on 107.7 The Bone in San Francisco. Of course as well as the illustrious The Woody & Wilcox Show. From 2001 to 2004, he also made Special Guest appearances during the KQ Morning Show's annual Live from Las Vegas simulcast; appearing on the panel throughout the show and reprising a few bits from his stand up act; including John Madden, Jerry Sienfeld, amongst others. On November 5, 2000, Caliendo appeared on Fox NFL Sunday, as a guest to comedian Jimmy Kimmel. He performed his increasingly noteworthy John Madden impression and was well received. He returned again the same season on January 7 during the playoffs. In 2001 and 2002, Caliendo returned as a semi-regular guest on Fox NFL Sunday. He frequently appeared impersonating Madden or occasionally as pundit Jim Rome during some of Kimmel's prognostication skits. At times he appeared live in the studio with the main hosts. In 2003, Kimmel departed the program, and Caliendo was named his permanent replacement. As the prognosticator for the Fox NFL Sunday, he gives his predictions ("Cold Hard Picks") for the day's NFL games. Typically these come during a skit (usually a one-man skit), where he does one of his famous impersonations. For example, for the first week's Fox NFL Sunday of the 2006 NFL season, he impersonated James Brown, who left the show in the off-season to join The NFL Today on CBS. He also imitates all the panelists of Fox NFL Sunday on occasion, most frequently Terry Bradshaw. On August 2, 2012, Caliendo announced on his official Twitter account that he would not be on Fox NFL Sunday for the 2012 season, and was replaced by Rob Riggle. Caliendo officially joined the cast of MADtv in 2001 as a repertory performer, for the seventh season, as the resident white male celebrity impressionist, in a similar vein to Dan Aykroyd, Joe Piscopo, Billy Crystal, Dana Carvey, Phil Hartman, Darrell Hammond, and Bill Hader on Saturday Night Live. In 2002, Caliendo replaced Will Sasso as the impersonator of George W. Bush, but he won audience members over with an offbeat impersonation of former Fox sports announcer John Madden and also many other Fox personalities. Both became some of the cast member's most popular impressions on MADtv, and were featured quite prominently during his tenure. Frank also did the announcing for the best of scenes on the MADtv season 1 DVD, and the announcing for the Season 2 DVD release which was cancelled due to poor sales of the first season DVD (though Shout Factory has now picked up the distribution rights to release the show on DVD). In August 2006, Caliendo announced he would not return to MADtv for its 2006–2007 season. Caliendo appeared in the 2007 film The Comebacks. He impersonates John Madden and Al Michaels in the championship game between the Comebacks and The Unbeatables. His Character is "Chip Imitation". Caliendo’s impression of President George W. Bush earned him an invitation to perform during the 2006 annual Radio-Television Correspondents Dinner. For two short seasons, Caliendo starred on Frank TV, his own sketch show on the TBS that began airing in November 2007. Frank was its host and performed in sketches in full makeup as characters he impersonated. In early 2008, TBS announced that they ordered eight more episodes, which ran later that year. The show ended after the fifteenth episode, which aired on December 23, 2008. During The Comedy Festival Caliendo hosted a special called The Comedy Festival Presents: Funniest Movies of the Year 2008 where, from Caesars Palace, Caliendo introduced the top ten list for funniest films of 2008 based on an Internet poll. 2011 Hot in Cleveland Kenny Season 2; episode 13: "Unseparated at Birth"
2014 Sullivan and Son Ralph Season 3; episode 6: "Lyle and Son"
2014 The Birthday Boys Himself Season 1, episode 4: "Rock and Roll"
↑ Thompson, Kevin D. (October 30, 2008). 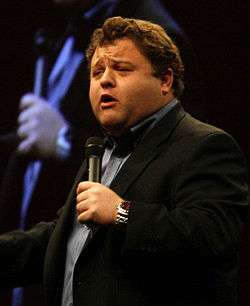 "TV Talk Q&A: Master Impressionist Frank Caliendo". Retrieved June 18, 2013. ↑ Caliendo, Frank. "To all my fans who've ben asking-I wont be back atFOX this season.I love those guys,but its time 4 my next venture". Twitter. Retrieved 3 August 2012. ↑ "Rob Riggle set to replace Frank Caliendo on Fox NFL pregame". USA Today. 2012-08-27. Retrieved 2012-09-23.